Bear Manager Sarah Dempsey has spent over two years caring for moon bears at Animals Asia’s Vietnam Bear Rescue Centre – making her perfectly placed to put the record straight about these wonderful, charismatic animals. 1/ There aren’t bears in Vietnam, are there? Yes, bears are native to Vietnam! One of the first things I hear when I say I work with bears at Animals Asia’s Vietnam Bear Rescue Centre is: “I didn’t know there were bears in Vietnam?” Well, yes there are! Asiatic black bears are native to Vietnam and throughout southern Asia from Pakistan to the islands of Japan. 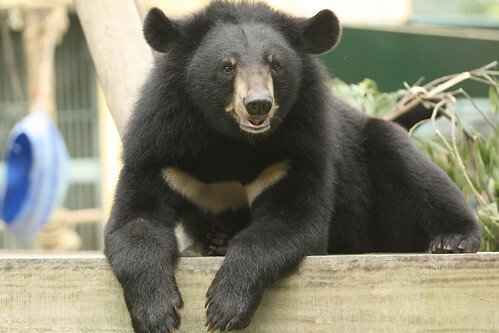 There are also other species of bears native to Asia and these include the smallest of the bear species, also native to Vietnam, sun bears (of which we have eight at our Vietnam Sanctuary). Other bears in Asia include sloth bears and probably the most famous and easily recognisable, giant pandas. 2/ So Asiatic black bears are the same as North American black bears right? Wrong! Asiatic black bears and American black bears are close relatives – closer than the six other living bear species – though there are notable differences. 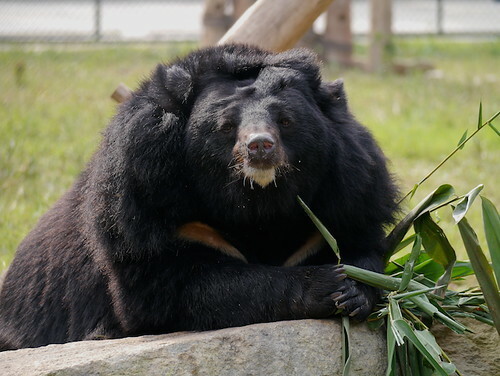 Similar in size to the American black bears, their fur is longer giving them a shaggier appearance often characterised by the long “ruff’ which most Asiatic black bears have around the neck. In northern parts of their range, Asiatic black bears tend to hibernate, but in the southern limits of their range they’re less likely to. 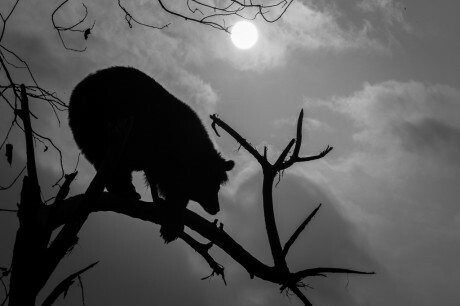 Meanwhile American black bears hibernate throughout the extent of their range and lack the characteristic moon–shaped crescent of pale yellow fur on their chest. And the nicest thing of all, unlike the smaller ears of American black bears, Asiatic black bears have the ears that have earned them the nickname of Mickey Mouse bears! 3/ All bears are carnivores right? Wrong! Like many other bear species, moon bears belong to the order Carnivora but are omnivores. Greenery ­– or browse – from trees makes up the bulk of their wild diet along with fruits and available vegetables such as sweet potato and corn. In smaller amounts they also enjoy insects, small mammals, fish and reptiles. They are incredibly opportunistic foragers, so food which humans have left behind makes its way in there too! At Animals Asia we try to replicate (the healthier parts) of a wild diet by providing the bears with daily native browse such as bamboo, jack fruit and ficus, fruits, vegetables and a small amount of dry dog food. As we keep them in semi-wild enclosures there is often the opportunity to forage for insects too, particularly termites, ants and earthworms. In the wild their diet also adheres to seasonal trends so we replicate this to the best of our ability by offering seasonal soft fruits in summer and chestnuts in winter. One of their absolute favorite foods both in the wild and here is honey, very much like the most famous bear of all! Though as this is a rarer and highly prized treat for wild bears, we also only use honey as an occasional high-ranking reward. Although Asiatic black bears have some notoriety for being aggressive when they come into contact with people in the wild (mainly if someone accidentally gives them a fright, or comes between a mother and cubs) this is actually a benefit in countries where they are frequently poached to be sold into the bear bile trade, and is far from true if captive bears are managed appropriately. When we rescue bears and bring them to our centres they will eventually be integrated into larger groups in bear houses that enjoy the benefits of large semi-wild enclosures. We use positive reinforcement to allow us to manage them easily in this type of setting. This is the process of increasing the chance of a behavior recurring by rewarding it. We use small pieces of fruit as rewards for bears when we need to move them between dens and in or out of the enclosures. We do the same when we need to see a bear close up for a quick health inspection or when a problem is reported, and also to weigh our bears on a regular basis. We find that when working with bears this way and always providing them with choice, we see calm bears that seem to enjoy interacting with staff and some love weigh days so much we struggle to get them to go back out when we’ve finished! 5/ Bears don’t feel pain, right? Very wrong! In February 2013, the China Daily quoted the China Association of Traditional Chinese Medicine (TCM) as saying, “The process of extracting bear bile was as easy, natural and painless as turning on a tap. After the operation was done, bears went out to play happily.” This is – as you can imagine – absolutely incorrect. Bile is extracted using various painful, invasive techniques, all of which cause massive infection. The pain bears on farms are clearly suffering from is often characterised not only by their physical condition but also by self-mutilation, noise, aggression, stereotypic behaviours (repetitive behaviours which serve no purpose but are commonly thought of as a coping mechanism) and in some animals complete apathy, all of which can be commonly seen in bears on bile farms. LYON, France – A five-month long INTERPOL-coordinated operation targeting wildlife trafficking in tigers and other big cats across Asia has resulted in the seizure of hundreds of animals and more than 160 arrests. Involving 13 countries, Operation PAWS (Protection of Asian Wildlife Species) also focused on lesser known species also in high demand by the black market, such as bears and pangolins. Wildlife traders using the internet and social media in certain countries were also investigated. Among the live animals recovered were tigers, leopards, bears, monkeys, red pandas, lions and crocodiles in addition to 3,500 kg of elephant ivory, 280kg of pangolin scales, rhino horns and more than 4,000 kg of red sandalwood. A large number of turtles, tortoises and birds were also seized across a wide range of countries indicating a high demand for these species. Designed and developed by the involved member countries as a collaborative law enforcement response to wildlife crime, Operation PAWS was coordinated by INTERPOL’s Environmental security unit as part of Project Predator, in addition to support from the International Consortium on Combating Wildlife Crime (ICCWC). Aimed at supporting and enhancing the governance and law enforcement capacity for the conservation of Asian big cats, INTERPOL’s Project Predator is primarily funded by the United States Agency for International Development. The 13 countries which participated in Operation PAWS which was conducted between July and November were Bangladesh, Bhutan, Cambodia, China, India, Indonesia, Laos, Malaysia, Myanmar, Nepal, Russia, Thailand and Vietnam. It was also supported by Australia, Canada and the USA. Dec. 18, 2014 by Bruce Einhorn – Einhorn is Asia regional editor in Bloomberg Businessweek ’s Hong Kong bureau. Follow him on Twitter @BruceEinhorn. It’s getting a little easier to be an animal in China. The country’s fledgling animal-rights movement this week received a double boost, with a animal-welfare law in the works and a prominent zoo taking action to stop animal performances. On Wednesday, Dec. 17, the Global Times, the tabloid affiliated with the official Communist Party mouthpiece the People’s Daily, reported that that the National People’s Congress is moving ahead on a plan to pass landmark legislation to protect animals, both in the wild and in captivity. Lawmakers have just completed a draft of the proposal, Chang Jiwen, vice director of the Research Institute of Resources and Environment Policies under the Development Research Center of the State Council, told the newspaper. In the spring, the Beijing zoo joined the foundation’s campaign against animal performances. Now the zoo in Hangzhou—the eastern Chinese city that is home to e-commerce company Alibaba (BABA)—has said it will stop animal performances after lobbying by the Animals Asia Foundation, the NGO announced on Tuesday. The law is to be toughened to give more protection to wild animals on the mainland, according to a news website report. A wildlife protection law introduced in 1988 is to be amended so that China recognises the concept of “animal welfare” for the first time, an expert working on the panel revising the legislation told the Shanghai-based news website Thepaper.cn. Professor Chang Jiwen, an academic at the Chinese Academy of Social Sciences‘ Institute of Law, was quoted as saying that the tougher laws would help protect many species around the country. “Animal welfare within wildlife protection law is a major milestone in the history of global wild animal protection as the vast land of China hosts one of the widest ranges of wildlife in the world,” Chang said. Some endangered species are protected under mainland law, but the report said there were no specific offences to punish people who harmed or were cruel to wildlife. Chang said the authorities also planned to revise regulations controlling animal habitats, but did not elaborate. International animal welfare charities have long criticised the authorities on the mainland for not doing enough to protect wildlife and domestic animals from cruelty and abuse. Their complaints include the demand in China for often endangered animals as food or as ingredients in medicines. Isobel Zhang, China manager for the British-based animals charity ACTAsia, said the step to include the general concept of “animal welfare” in legislation was a huge step forward, but pets and farm animals should also be included to give them greater protection. “It means the law is beginning to aim at animal protection, but the law should clearly state its scope,” she said. “[It] should also discuss extending the concept to non-wildlife. The mainland lacked legislation to punish people who were cruel to animals or who exposed them to unnecessary suffering or harm, Zhang said. “While the exact benefits to animal welfare are yet to be seen, this could at least help in generally advocating for animal protection,” she said. The report comes after two men were jailed on Monday for killing a donkey from an endangered species in Tibet . The two men chased and hit the kiang in their car. They then killed it with a knife and disemboweled it. The pair were jailed for 3½ years and one year. They were also fined 80,000 yuan (HK$101,000) and 20,000 yuan. They took photographs of themselves with the dead animal and posted them online, sparking public outrage. 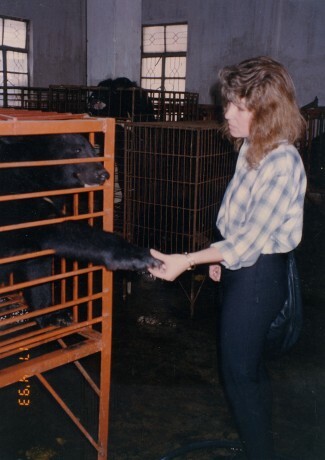 Animals Asia founder and CEO Jill Robinson (as heard on the Our Hen House podcast – Episode #199) first witnessed the cruelty of bear bile farming in 1993. Since then, she has worked tirelessly to end the industry. Animals Asia’s “Healing without Harm” program continues to collaborate with traditional medicine practitioners to end the demand for bear bile. Today on Our Hen House, Jill shares with us her experience with traditional medicine practitioners who also want to end the cruelty. Only in my wildest dreams did I think I would witness traditional Chinese medicine doctors burning bear bile in the streets of Chengdu. But that is exactly what happened in 2010 when Animals Asia began our Healing without Harm campaign. At that time, a small but determined group of Chinese doctors decided they wanted to finally speak out against the practice of bear bile farming, so these ambassadors voted with their businesses and their profits, and agreed to never sell or prescribe bear bile again. Four chains of pharmacies, comprising 33 shops, came on board during that monumental year. Movingly, groups of students also joined in by campaigning against the industry. Launching banner exhibitions in their universities, these passionate students publicly voiced their opposition to the farming of bears for the extraction of their bile. It appeared as though things were beginning to change for these majestic bears who stole my heart and set me on my life’s mission, so many years ago. 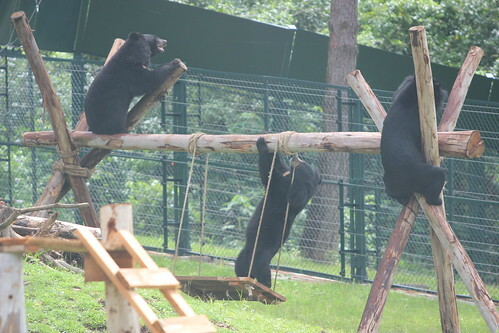 Bear bile farming is not a traditional practice. In fact, it began in China in the early 1980s as a “solution” to the problem of endangered moon bears being killed in the wild for their gallbladders. Tragically, this “solution” was a horrifying one, resulting in thousands of bears being caged – many hunted from the wild – and surgically mutilated with crude metal or latex catheters inserted into their abdomens and gallbladders. 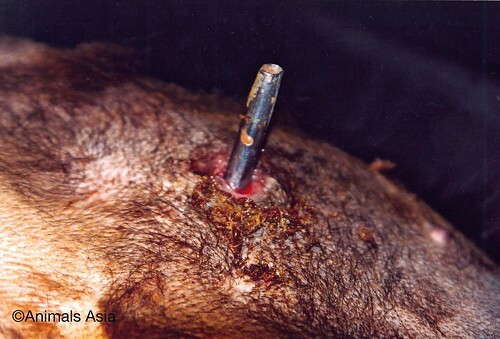 Later, a new, so-called “humane” method of bile extraction was sanctioned by the authorities: A gaping hole was cut into the bear’s abdomen and gallbladder, allowing bile to drip out of a wound that never healed. In addition to these brutalities, bears on bile farms are often subjected to cruel and painful procedures to eliminate any possibility that they can fight back. Their teeth are cut back to gum level. Their paw tips are hacked away to make them less dangerous. And aside from the mutilations imposed upon them, many bears self-mutilate by constantly banging or rubbing their heads against cage bars. Although there has been some recognition that these practices are wrong, there is no easy fix. 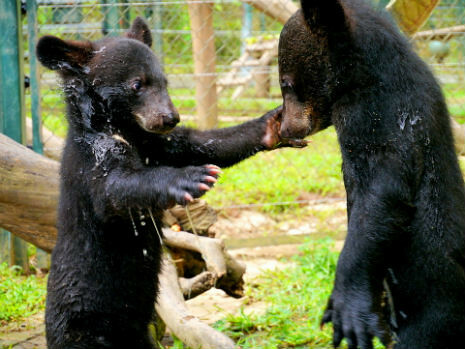 Bear farming is now actually illegal in Vietnam, but, nevertheless, the practice continues. In fact, there remain some 2,000 bears left on farms. Many still have their bile illegally extracted after being subjected to a crude anesthesia using illegal drugs. The semi-conscious bears are then jabbed with a four-inch needle until the bile is found. It is drawn from the bodies via a mechanical pump. Fundamental to this rescue – and to our ongoing evidence of how bear bile farming exploits and kills members of endangered species of bears – is our work with the traditional medicine community. One of our most successful campaigns is Healing without Harm, a campaign collaborating with practitioners of traditional medicine, independent pharmacists, and pharmacy chains. The campaign also engages collaborations with pathologists and liver specialists in China and Vietnam to gather evidence on the implications for human health of consuming contaminated bile from diseased farm bears. As the Council Member of the World Federation of Chinese Medicine Societies Herbal Committee, I have been fortunate to have met many traditional medicine doctors who have no compunction in emphasizing that bear bile has no place in their discipline today. One such practitioner, Lixin Huang, who is Chairman of the American College of Traditional Chinese Medicine, goes so far as to say, “We ask bear farmers not to use the excuse of traditional medicine as a reason for farming bears, because we do not need bear bile to save patients’ lives.” This is a bold statement, considering that bear bile has been used for thousands of years in Asian pharmacopeia. To take other animals lives is like taking our own lives and, on behalf of Changsha FDA, I pay my respect to all the pharmaceutical industries who are respecting life, caring for animals, refusing bear bile products, and saying no to animal cruelty. To regulate animal medicine and promote the continued development of medicine and ecology, we need to research synthetic alternatives of animal medicines, and do our best to protect animals. Similarly, the Vietnamese Traditional Medicine Association has, along with Animals Asia, produced a booklet for their members highlighting the 32 herbal alternatives to bear bile, and have pledged to see bear bile usage reduced to less than five per cent by the end of 2016. Hopefully, this escalating support will not only help the bears suffering on farms, but will aid those in the wild, too. After all, the most important underlying principle behind Chinese medicine is to take the easy, avoid the difficult, and “be compatible with nature.” These are ideas that anyone who cares about animals can stand behind. Whether fighting for animal rights, or for the conservation of endangered species – or for the preservation and development of traditional Chinese medicine – we each can find common ground. Even the bear farmers themselves increasingly appear trapped in an industry that they’d love to escape. To the bears in those tiny cages, the benefits of Healing without Harm are obvious. But, with a common vision, this campaign should actually serve all parties, and our challenge and mission is to achieve that. 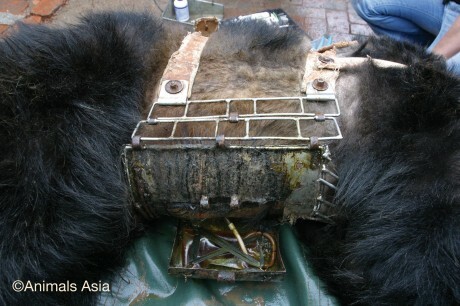 Only then can bear bile farming finally be a nightmare of the past. Perhaps my dreams are not so wild after all. 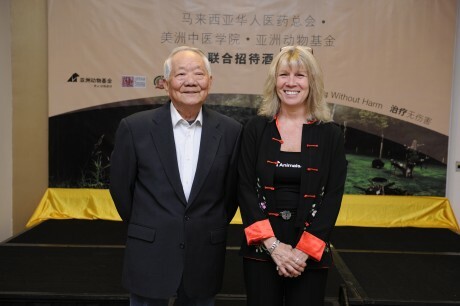 Animals Asia founder and CEO Dr. Jill Robinson arrived in Hong Kong in 1985 and spent 12 years working in Asia as a consultant for the International Fund for Animal Welfare. 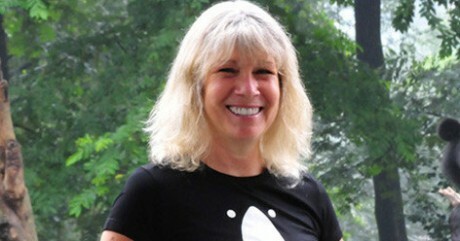 Repeatedly faced with scenes of widespread animal cruelty, Jill founded “Dr. Dog” in Hong Kong in 1991 – the first animal-therapy program in Asia. In 1993, a visit to a bear farm in southern China changed her life forever. 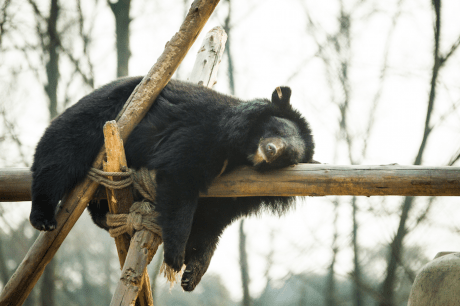 Discovering the plight of endangered Asiatic black bears (also known as moon bears), Jill embarked on a journey to end the practice of bear farming once and for all. In 1998, she founded Animals Asia, an organization that is devoted to ending the barbaric practice of bear bile farming and improving the welfare of animals in China and Vietnam by promoting compassion and respect for all animals, and working to bring about long-term change. Animals Asia began as a small group working out of Jill’s front room. She has since built the organization into a respected international NGO with over 300 staff members, an annual turnover of more than $9 million, and award-winning bear sanctuaries in China and Vietnam. Animals Asia is headquartered in Hong Kong, with offices in Australia, China, Germany, Italy, the U.K., the U.S., and Vietnam. Conservation groups have joined forces to stop the auction of black rhinoceros horns and elephant tusks in Sydney on Friday, saying the sales will increase demand and consequently poaching, which is decimating the species. 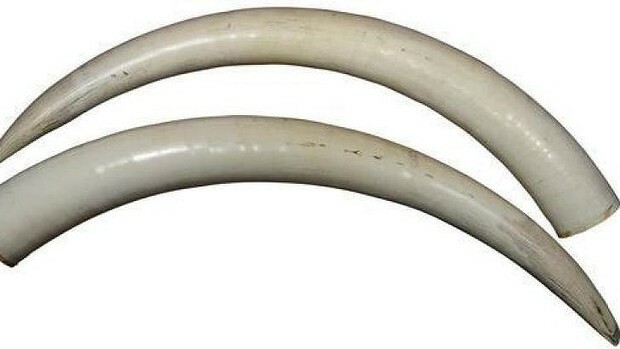 Auction house Lawsons, based in Leichhardt, expects the bidding war for the black rhino horns to hit $70,000; the pair of unmounted African elephant tusks to reach $70,000, and the embellished elephant tusks with a gong to reach $16,000. Humane Society International (HSI), with backing from the International Fund for Animal Welfare and Greenpeace, is demanding Lawsons pull the items from auction and change its policies to prevent similar items from surfacing in the future. “The pressure on the remaining wildlife populations of rhino in Africa, India and [south east] Asia is such that all efforts must be made to stop rhino horn being trafficked,” wrote Alexia Wellbelove, senior program manager at HSI, in a letter to Martin Farrah, managing director at Lawsons. The world rhino population has dropped from 500,000 at the start of the 20th century to just 29,000 because of poaching, according to the Save the Rhino organisation based in London. The price of rhino horns has skyrocketed in the past decade because of rising demand from Chinese and Vietnamese people who believe it can cure cancer and be used as an aphrodisiac. In March, Lawsons sold a pair of rhino horns mounted on a wooden plinth for $92,500 – a figure that shocked antique and auction experts across the country. Simon Hill, general manager of Lawsons, said the black rhino horns belonged to a Cairns woman who inherited them from her father who migrated from Africa to Australia in 1950. He said the auction house has contacted the federal environment department to obtain approval for Friday’s sale of the 4.6 kilogram rhino horns set and elephant tusks. Under Australian law, the import and export of rhino horns dated from 1950 is banned and, since July, anyone wishing to export vintage rhino horns must conclusively prove its age through radiocarbon dating. A department spokesman confirmed to Fairfax Media that investigators had assessed the specimens and were satisfied of their lawful origins. The department granted approval for the domestic sale of the three items only. 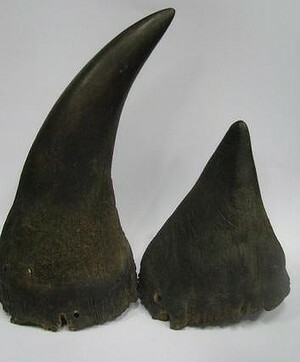 Mr Hill said it was only the third time since 1999 that he had seen rhino horns up for auction at Lawsons. “I understand [the conservationists’] concerns and we have them equally. We take it very, very seriously and that’s why we go through the relevant bodies to make sure we’re doing the right thing,” he said. 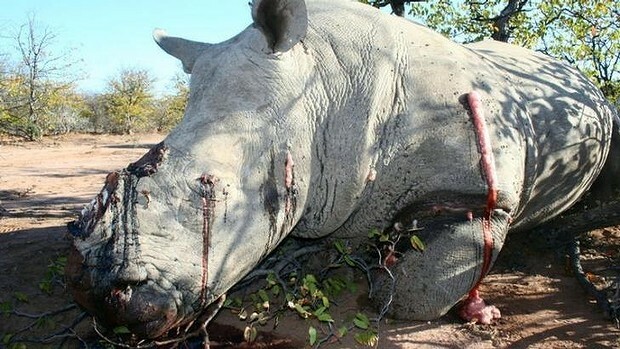 So far this year, 969 rhinos have been poached in South Africa, according Save the Rhino. It claims poaching is “dramatically increasing”. 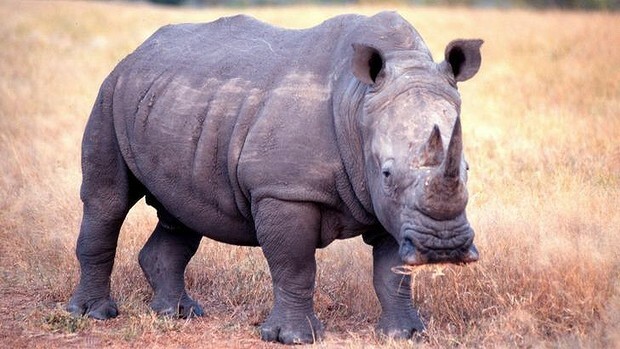 The Western black rhino was declared extinct by the International Union for Conservation of Nature in 2011. All five remaining species are listed on its threatened species Redlist, with three classified as critically endangered. 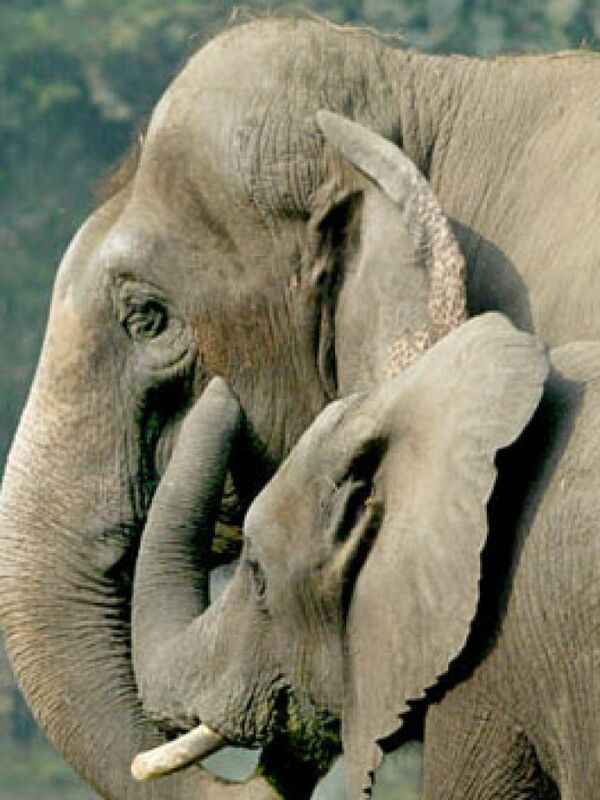 “Elephant populations are also in big trouble in Africa and elsewhere. By continuing to sell elephant ivory, we’re continuing to create demand and therefore increase poaching the populations can’t sustain,” Ms Wellbelove from HSI said. On Tuesday, Greenpeace rallied its 400,000 supporters via email, urging them to contact Mr Farrah to demand he pull the horns and ivory from Friday’s Natural History, Taxidermy and Science auction and change Lawsons’ policies. An International Fund for Animal Welfare report released this year revealed the number of products derived from endangered animals offered for sale on Australian websites has more than doubled since 2008. Tanzanian officials have dismissed claims Chinese diplomatic and military staff have purchased illegal white ivory while on official visits to East Africa made by an environmental activist group. The country’s foreign minister said the report by the UK-based Environmental Investigation Agency (EIA) was a “fabrication” designed to upset growing ties between Tanzania and China. “We should ask ourselves as to why these allegations are surfacing a few days before (Tanzanian) president Jakaya Kikwete‘s visit to China,” foreign minister Bernard Membe told parliament. “It is obvious that perpetrators of these allegations are people who do not wish to see our country attain development. The minister asserted that the two countries have been sharing intelligence reports which have enabled numerous interceptions of ivory destined for China from Tanzania. “China is doing a lot to help us solve this wildlife-threatening crime,” Tanzania’s tourism minister Lazaro Nyalandu said. “It is easy to see how cooked-up the report is, because saying that the Chinese president‘s plane was used to carry tusks is illogical. According to the EIA, when Chinese president Xi Jinping visited Tanzania in March 2013 members of his government and business delegation bought so much ivory that local prices doubled. The group quoted ivory traders as saying the buyers took advantage of a lack of security checks for diplomatic visitors to smuggle their purchases back to China on Xi’s plane. The report said similar sales were made on a previous trip by China’s former president Hu Jintao and Chinese embassy staff have been “major buyers” since at least 2006. Chinese foreign ministry spokesman Hong Lei also described the report as “groundless”. Tens of thousands of elephants are estimated to be slaughtered in Africa each year to feed rising Asian demand for ivory products. Reports said the demand comes mostly from China – the continent’s biggest trading partner. Almost all ivory sales were banned in 1989 by the Convention on International Trade in Endangered Species of Wild Fauna and Flora to which both China and Tanzania are signatories.